Since ancient times, flowers were considered the most beautiful ornaments for women. 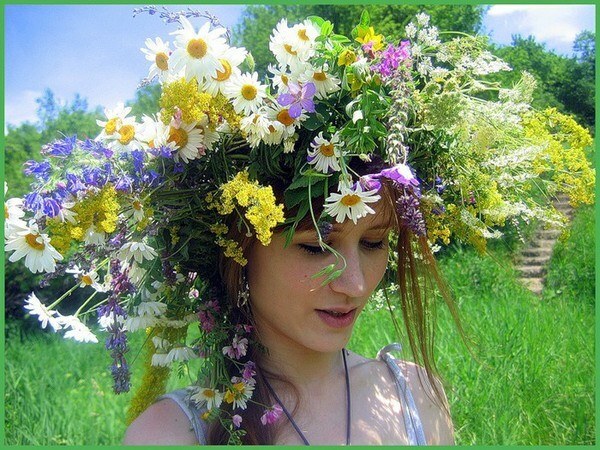 For example, brides are often decorated with wreaths and intertwined in her hair flowers. Also you can make a beautiful wreath of artificial flowers with their hands. Currently a floral wreath became a fashion trend. However, some designers replace the wreaths for the flower headbands. What would it take to weave a floral wreath? To master the technique of weaving a wreath of artificial flowers is a snap. First need to prepare the necessary materials such as: artificial flowers, floral wire, satin ribbon, tape, silicone glue. And of course, the work can not do without a heat gun, wire cutters and scissors. First of all, you need to make a frame for a wreath of floral wire. Density connect three or four pieces of wire and wrap them with a special teip-tape. Then try the frame on your head, it needs to be a little too big. Artificial flowers are carefully cut from the branches with wire cutters. At the same time you must be the stem length to 5 cm. It is recommended to prepare in advance flowers that are required for weaving of the wreath. Just in the process better not to be distracted by cutting a new batch of flowers. Start braiding from the front of the wreath. Attach one flower to the frame and attach it teip-tape. If you want to have flowers securely held in a wreath, attach them with one large piece of tape, not several small ones. Gradually fill half of the frame from one flower to another. The first part of the wreath is ready. Now you can do the weaving of the second half of the product. Note that the flowers in the second half of the wreath needs to look in the opposite direction. The result is that the flower heads of the two frame halves are arranged one against the other. As for the back of the frame, its not to fill out about 6-7 inches. This place should remain free in order to be able to attach a satin ribbon. After complete filling of the frame needs to be tapirisat the rest of it in two layers. In the next stage cut in meter pieces of ribbon of different colors. It is best to use red, orange, yellow, green, blue and purple ribbons. Of course, ideally, you need to take 6 strips, width of each of which will be two and a half centimeters. You will then need to glue the Central portion of each ribbon to the frame. You can use silicone adhesive. Remember to handle the edges of the ribbon with fire so they don't Ravel. A wreath of artificial flowers ready. The same principle can weave a wreath of flowers. Only pre-flowers have to zataplivat.